Of all the heresies that warrant a loss of olam ha-ba why would the Mishna specify denial of the resurrection? While part of the answer may be historical — denial of the resurrection may have been pervasive at the time — the Gemara indicates that the answer alludes to a more fundamental principal. The Talmud wonders why the repercussions of denying the future resurrection are so severe.1 The Talmud responds, “He denied it [techiyat ha-meitim], and therefore, he has no portion in it [olam ha-ba].”2 How are we to understand the nature of this measure for measure punishment and how has the Gemara answered why denial of techiyat ha-meitim warrant loss of olam ha-ba. The concept of olam ha-ba is among the fundamental principles of Torah, as can be seen from the fact that one who denies it has no share in olam ha-ba, even if he studied Torah and did other good deeds… Moreover, divine justice is dependent on the concept of olam ha-ba, because only through it does a person get what he deserves. Therefore, we must explain its nature based on the tradition we received from our fathers and teachers. Ramah explains that without belief in the afterlife, there can be no justice. Indeed, Rambam lists belief in reward and punishment among the thirteen principles of faith.4 He specifically highlights olam ha-ba in this context. “Sell me your birthright ka-yom.” When Yaakov and Eisav were in their mother’s womb, Yaakov said to Eisav, “My brother, there are two worlds before us, olam ha-zeh (this world) and olam ha-ba. Olam ha-zeh has eating, drinking, commerce, marriage, and the bearing of children. Olam ha-ba has none of these. If you would like, take olam ha-zeh, and I will take olam ha-ba, as it says, “Sell me your birthright ka-yom,” [meaning] like the days we were in the womb.5 With this, Eisav denied techiyat ha-meitim, as it says “Behold I am going to die, and why do I need the birthright?” At that moment, Eisav took [Yaakov’s] portion in this world, and Yaakov took Eisav’s reward in olam ha-ba. This is not to say that Yaakov is motivated by reward in the afterlife. For example, Rambam (Hilchot Teshuva 8:7) notes that David ha-Melech longed for olam ha-ba, even as he maintains that he was not motivated by reward in olam ha-ba (Hilchot Teshuva ch. 10). Rather, we are arguing that awareness of the realness of olam ha-ba is a central aspect of Jewish faith. As such, its denial warrants loss of olam ha-ba. 1 Many sources indicate that this should not be seen as a punishment as much as a natural outgrowth of this heresy. 2 Ramban in Sha’ar Ha-Gemul and Yad Ramah note that this passage implies that by denying techiyat ha-meitim, one has denied olam ha-ba, which supports the notion that we will have a physical body in olam ha-ba. According to Ramban when a person dies, his soul and body separate, with the soul continuing to exist in the olam ha-neshamot, the world of the souls. This includes Gan Eden and Gehinnom. Gan Eden and Gehinnom exist now, while olam ha-ba will be created following the conclusion of the messianic era. At that point, the body will reunite with the soul (techiyat ha-meitim) and enjoy the ultimate spiritual existence. It must be stressed that despite our physical body our existence in olam ha-ba is entirely spiritual. 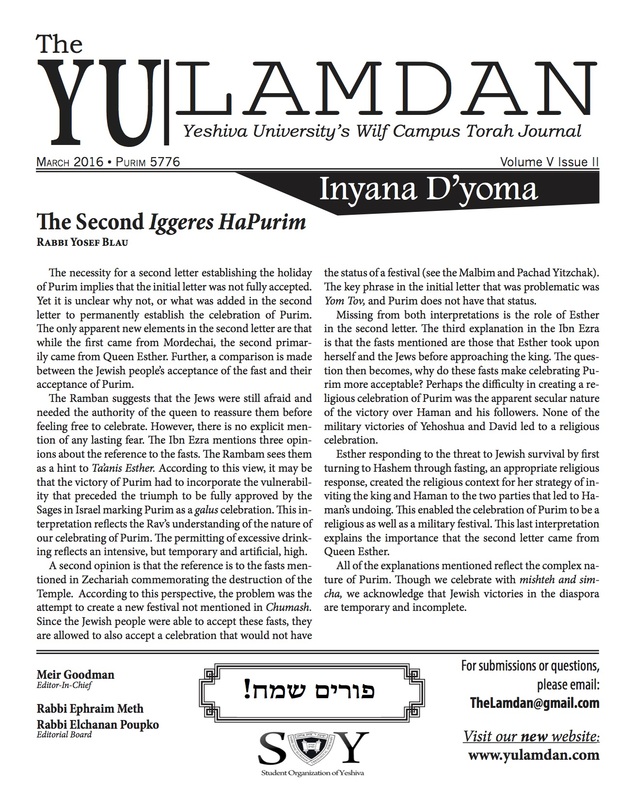 3 See the opening chapter of Messilat Yesharim. 4 The thirteen principles of faith appear in Rambam’s commentary on the Mishnah (Sanhedrin chapter 10). 5 The Midrash understands that the word ka-yom is superfluous and teaches us that when Yaakov asks to buy the birthright, he is referring to the conversation they had in the womb. 6 The aforementioned Talmudic passage notes that on the day Eisav transferred the bechora, he committed five cardinal sins, each of which reflected his worldview. For example, why does the Talmud state that that Eisav slept with a betrothed maiden, naarah meurasa instead of saying that he committed adultery? After all, the concept of naarah meurasa did not even exist at the time (see the beginning of Hilchot Ishut in Mishneh Torah). R. Ahron Lopiansky explains that the concept of eirusin highlights an orientation towards the future. Even though the maiden is now in her father’s house, she already is considered an eishet ish based on her future status. Eisav’s worldview denied the idea that tomorrow’s reality should affect today’s activity.